The radar module that [Shahriar] works with in the video below is a CDM324 that can be picked up for a couple of bucks from the usual sources. As such it contains a lot of lessons in value engineering and designing to a price point, and the teardown reveals that it contains but a single active device. [Shahriar] walks us through the layout of the circuit, pointing out such fascinating bits as capacitors with no dielectric, butterfly stubs acting as bias tees, and a rat-race coupler that’s used as a mixer. The flip side of the PCB has two arrays of beam-forming patch antennas, one for transmit and one for receive. After a few simple tests to show that the center frequency of the module is highly variable, he does a neat test using gimbals made of servos to sweep the signal across azimuth and elevation while pointing at a receiving horn antenna. This shows the asymmetrical nature of the beam-forming array. He finishes up by measuring the speed of a computer fan using the module, which has some interesting possibilities in data security as well as a few practical applications. Even though [Shahriar]’s video tend to the longish side, he makes every second count by packing in a lot of material. He also makes complex topics very approachable, like what’s inside a million-dollar oscilloscope or diagnosing a wonky 14-GHz spectrum analyzer. Scientists working to advance the frontier of knowledge frequently also need to invent their tools along the way. Sometimes these are interesting little hacks to get a job done. Recently some researchers found ancestors of moths and butterflies older than any previously known by analyzing tiny scales found alongside ancient pollen. They needed a tool to manipulate these scales: separating them from surrounding debris, transferring them to microscope slides. The special tool was a needle tipped with a single human nostril hair. As ancient insects were the published paper‘s focus, their use of nose hair tipped needle was only given a brief mention in the “Materials and Methods” section. Interviews by press quoted researchers’ claim that nose hair has the right mechanical properties for the job, without further details. Not even a picture of the tool itself. What properties of insect scales made them a good match with the properties of nose hair? Was there a comprehensive evaluation of multiple types of hair for the task? Would we regret asking these questions? Novel approaches to fine-tipped tools would be interesting to examine under other contexts, like the tweezers we use to build surface-mount electronics. As SMD parts continue to shrink in size, will we reach a point where hair-tipped tools are the best DIY alternative to an expensive pick-and-place machine? It would be another creative approach to deal with the challenges of hand-built SMD. From simple but effective mechanical helpers, to handy 3D printed tools, to building hybrid Manual + CNC pick-and-place more affordable than their fully automated counterparts. If you think that Arduinos are overkill in most projects we can do one better for you. [Jack Gassett] has a virtual Arduino running on a Field Programmable Gate Array. We checked in with [Jack] back in November to see his work with the AVR8 Soft Processor, an FPGA version of an AVR chip. Because the Arduino uses AVR it wasn’t too much of a leap to make this Arduino compatible. We’re lacking in imagination when hit comes to using this method productively, but we’re sure someone will find a way. [Jack] wrote in to let us know about a project that creates a virtual microprocessor core based on the ATmega103 by using a Field-Programmable Gate Array. Great, we thought. Here’s another rather esoteric project like the NES on a FPGA, but what’s the motivation behind it? We asked [Jack] and he provided several scenarios where this is quite useful. Implementing the AVR core allows code already written for the chips to be easily ported to an FPGA without a code rewrite. This way, if your needs outpaced the capabilities of the microcontroller long after the project has started, you can keep the code and move forward from that point with the added capabilities of the gate array. Having the core already implemented, you then only need to work with HDL for the parts of the project the AVR was unable to handle. He also makes the point that having an open source AVR core implementation provides a great tool for people already familiar with AVR to study when learning VHDL. 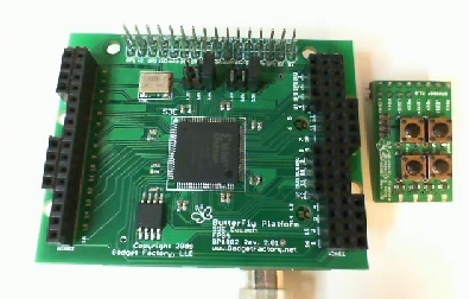 With products like the Butterfly that this project is based around, or the Maple we’ve seen in the past, programmable logic for the recreational hacker is starting to get a little easier.